Most aircraft fly internationally, and many non-EU operators use the Temporary Admission procedure when they fly within the EU. The basic simplified rule is that an aircraft owned, operated, registered or based outside the EU can use the Temporary Admission procedure. The period of stay for private flights is set to a maximum of 6 months but there has been an on-going discussion for years in the aviation society about how this rule shall be interpreted when we talk about multiple stays over a period. We have therefore commissioned another verification survey about this subject. The feedback is almost unanimous; a new 6 months period begins each time the aircraft re-enters the EU. The other two mentioned below, options A and B, have been fully rejected as viable options. Only Spain and Greece have answered differently. Please notice that the answer from Spain is incoherent and obscured and does furthermore not indicate how a new period can be initiated. Does this mean that an aircraft can stay ‘forever‘ at the same airport if the aircraft is flying in and out on a continuously basis in order to initiate a new period of stay? The answer is no. The Temporary Admission procedure is meant to accommodate non-EU resident visitors flying within the EU and the procedure was never meant to accommodate aircraft with a fixed base or accommodate aircraft which ‘lives‘ the majority of their life inside the EU. If an aircraft has a fixed base in the EU, have booked permanent hangarage or do long time parking, the aircraft can no longer be considered a ‘visitor‘ and this is seen as the behavior of a ‘resident/domiciled‘. Our opinion is that a non-EU registered aircraft with a behavior as a ‘resident/domiciled‘ in the EU must be fully imported. How is the 6 months period defined and which of the three options can be used? 1) Local application of legislation and customs internal guidelines is unclear/unspecific, but is the preferred answer. 2) The answer is based on a ruling where the Spanish authorities deciphered that this period cannot be suspended, even under the supervision of customs authorities. The Spanish answer does also mention that the 6 months period is not a clear-cut issue in Spain. This is a grey zone and it is risky to have a behavior as ‘resident/domiciled‘ with the Temporary Admission procedure without a specific case ruling from the local customs where they approve of multiple, continuously stays at the same airport/EU member states. A stamp on the ‘Supporting document for an oral customs declaration‘ does not mean that the local customs have accepted a certain behavior. The stamp simply documents the date of entry. Most non-EU operators already use Temporary Admission. Full importation includes a lot of potential VAT/tax liability which nobody wants, and typically requires 5 years of correct economic activity and 7 years of recordkeeping. All these factors are eliminated with the use of Temporary Admission and most non-EU operators will in fact have the same flying privileges as under full importation. Temporary Admission will give the declarant more flexibility and extra advantages such as unrestricted personal, family and guest usage also for EU-resident passengers. This update relates only to the use of Temporary Admission with total relief from import duties. 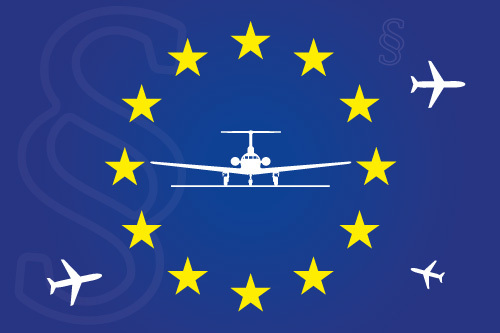 It does not apply to full importation into the EU where the aircraft is exempt as being used for commercial flights with an AOC/Charter certificate or where full importation is used combined with reclaiming the VAT imposed during the importation.